A quick follow-up and thank you is in order. Randy emailed me shortly before the show and said "I even put in an order for warm weather to melt the snow next week." True to his word, the weather was perfect and the trek down and back north was excellent. Chico this year was the best in recent memory. Lots of neat stuff on the tables. Many thanks to all that took advantage of the "fire sale prices" at my table, as well as those that helped me bring back more than I arrived with. I know "hoarditis" is an illness. And incurable. But it's an illness in a good way and as such, I'd prefer to remain both infected and contagious. This coming weekend is Morro Bay. I hear that it's a killer venue. Small but fun and often loaded with sleepers. Sadly for me, it's two days down and two days back; and as such not on the plate. I'd love to hear what slips in the door this year, so please, do tell! And so, we next set our sights on Antioch. April 8 & 9 Antioch, Ca. It's an old school show, dating back decades. If memory serves, I first attended the Golden Gate Historical Bottle Society show in the very early 70's, back when they were located at the Cow Palace in South San Francisco. Always fun, always packed with good people, and good stuff, this is another can't miss show and as such, I'm as excited about being a part of it in 2011 as I was in 1970! Again, hope to see all at Antioch. April in the Bay Area is "the" time to visit! So why not tie your mini vacation in with a great bottle show? March Madness - Relief at last! Winter in Southern Oregon. I hate it. Cold, wet, gloomy; seemingly never ending. It starts around the last week of October, and by the first of March, what little sanity I ever possessed is gone. The second weekend of March signals a turning point for me, and is something that I look forward to annually. That weekend is prominently circled on my calendar every year without fail. And what happens that weekend? My annual early Spring pilgrimage to central California. Warm weather, usually rain free, bright green pasture grasses and orchards bursting with blossoms. Oh yes, and bottles! Yep; it's time for the Chico show. MARCH 11th & 12th CHICO CA. PS: Got whiskies to sell? Come see me, I'm always in the market to buy! The "rest of the story" took some time to dig up, but the reason for the rarity of these bottles becomes crystal clear. Fred H., and Christian H., Hilbert did indeed set up shop in 1890. The first reference that I found was in the Crocker Langley directory for 1890. But, they were located not on Folsom St. (as Thomas stated) but instead at the NW corner of Seventh and Bryant. I could find no evidence supporting Thomas's claim that they ever were located on Folsom St. They remained at Seventh and Bryant for two years, and located to 101 Powell in 1892. By then they were listed in bold type and it appeared things were going well. They obtained telephone service in February 1893 and were assigned #3171 by the Pacific Telephone and telegraph Company in February of that year. Trouble appeared on the horizon as early as the following month. 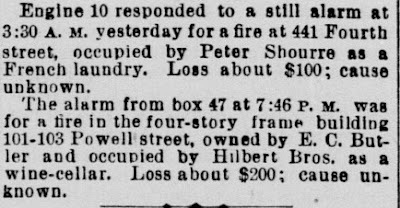 On April 6, 1893, Hilbert Bros. advertised the 101 Powell St. address for sale. Not only was it for sale, the ad stated "must be sold". The firm had a "near miss" with disaster on the evening of Oct. 29, 1893, when the fire department responded to an alarm at an address listed as 101 - 103 Powell St. Firefighters extinguished a fire in the area used for wine storage. Cause of the fire; unknown. Hmm, I guess that's one way to deal with cash flow issues. Looks like the torch could have used a little practice though. The 1893 Directory is missing from the archives but by 1894, they were listing their address as 101 - 103 Powell St. Instead of bold type, they were back to being shoehorned in with the rest of the small time operators and all but disappear in small font size. 1895 saw them reassigned with a new telephone number (South 171) but still at the 101-103 address on Powell. Early 1896 appears status quo but by the fall of 1896 all reference to the 101 Powell St. address vanishes and they are listed exclusively at the 103 site. The S.F. Call of October 1, 1896 lists their "old established liquor store and bar" for sale. On January 18, 1897, the noose appears to have tightened further and their enterprise (grocery and bar) was offered simply for lease, lock stock and barrel, for the princely sum of $750~ for three years. The following tidbits are irrelevant to the early bottles and their rarity, but nevertheless provide a little more insight into the workings of the business. Thomas states that the name of the firm was changed to the Hilbert Mercantile Co. in 1903. 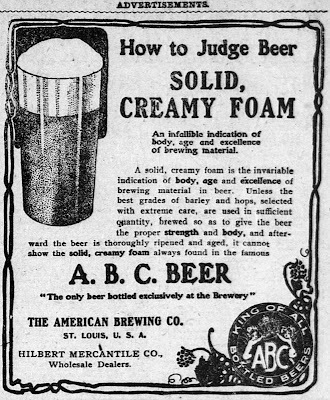 An ad dated Dec. 7, 1903 supports this and advertises them as Pacific Coast Agents for ABC beer. The 1905 directory does indeed list Hilbert Mercantile, located at 136 - 142 2nd. St. Things get a little cloudy about this time though. A newspaper article dated October 28, 1905 lists Hilbert Bros. as the creditor in a suit filed against F. Cavagnero (Columbian Bourbon). Not sure what the name discrepancy was all about. Another contradiction appears in the form of an ad from this year showing their Bourbon Whiskey being sold at fire sale prices. Note the name; (Hilbert Bros.). It would appear that the beginning of the end was at hand and they were grasping at straws to hang on. Oddly enough, the pre-Earthquake 1906 directory fails to list either Hilbert Bros. or Hilbert Mercantile. Although Thomas states that they were destroyed in the disaster, evidence point to the firms demise shortly before. 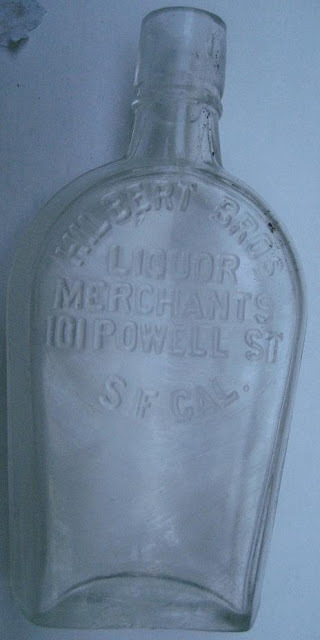 That being said, it is evident that they were exclusively at the 101 address embossed on the bottle for only two years; 1892 - 1894. Times were apparently tough during that window of opportunity. Best guess is that they jumped in with both feet and had private molds made as soon as they moved into the 101 Powell St. location. Once the initial supply was used up, their product was probably bottled with paper labels only to reduce expenses. Had the firm prospered, one would expect to see volumes of advertising, and a bottle embossed with both the 101 and the 103 address. Instead, we see one amber full face cylinder design (both tooled S.F. Glass and German connection glop top), another clear (both tooled S.F. Glass and German connection glop top), with 101 embossed and another S.F. Glass full face tool top sans any address in the way of early bottles. There also exists an extremely rare coffin with the 101 address on it. Newspaper archives are completely and totally void of any advertising and it appears that they were either content with, or forced to, make ends meet on a very small scale. The firm of Hilbert Bros. seems to have endured ongoing financial hardships for it's entire life span. The early years were tough, but they managed to eke out an existence, barely, and we have that to thank for the exceptional rarity of their early glass.